With his fourth world title already secure, Hamilton had no need to chase the win. He finished 4 seconds behind and did not get close enough to attack. 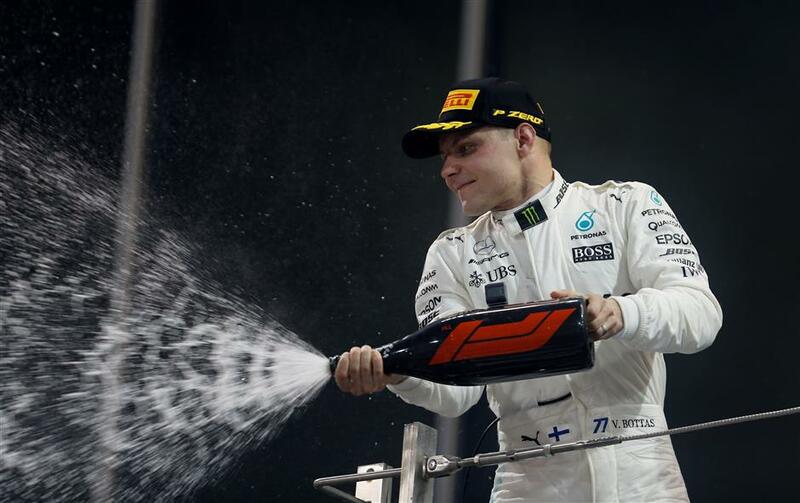 Mercedes' Valtteri Bottas of Finland sprays champagne as he celebrates winning the Formula One Abu Dhabi Grand Prix at the Yas Marina circuit, Abu Dhabi, United Arab Emirates on November 26, 2017. Valtteri Bottas won the season-ending Abu Dhabi Grand Prix from pole position on Sunday, beating his Mercedes teammate Lewis Hamilton as Formula One's season finale petered out into a procession. The Finnish driver comfortably secured the third win of his F1 career, all coming this season since joining from Williams. It was his 22nd career podium and 13th with Mercedes. "It is a really important win for me after having a pretty difficult start to the second half of the year," said Bottas, who had a mid-season slump that affected his confidence. "We Finns don't show much emotion but it doesn't mean we don't have any. I am so happy. There has been so much support. I can't show it too much but I feel good." Bottas in third place overall, 12 points behind Ferrari's German driver Sebastian Vettel and 58 behind Hamilton. "Hopefully better next year," said Bottas, who has another year on his Mercedes contract and will be under pressure to improve. "Valtteri did a great job to hold me off," Hamilton said. "Congratulations to him." The race started at 5pm local time with the sun setting on the desert setting of the Yas Marina circuit and finished under floodlights. Bottas started from pole for the fourth time this season and assuredly held the position into the first corner. Vettel, who won the last race in Brazil, finished 20 seconds behind him in third place. "After three or four laps, I just couldn't go any faster," Vettel said. "Congratulations to Lewis on his season. He was the better man. I hate to say it but he deserved it." Vettel's Ferrari teammate Kimi Raikkonen was fourth and also moved up to fourth in the standings. Hamilton clinched the world title — his third with Mercedes — in Mexico two races ago when he ended Vettel's fading hopes. Red Bull driver Max Verstappen finished fifth while teammate Daniel Ricciardo retired, dropping from fourth to fifth in the standings. The other wins for Bottas this season came in Russia and in Austria — also from pole — and he performed spins on the track to celebrate. Hamilton, who won nine races this year, did the same. Bottas made a clean start while Hamilton held off Vettel, who locked his left front tire angling into the first corner. The 5.6-mile track is difficult to overtake on and the top grid positions were easily held. After 21 of 55 laps Bottas was 2.5 seconds clear of Hamilton and eight ahead of Vettel, who was the first of the trio to pit for new tires. Bottas did one lap later, leaving Hamilton briefly in front. At much the same time, Ricciardo retired, leaving his stranded Red Bull on a patch of grass as he hitched a lift back to the team garage on the back of a scooter. It was the third time in four races — and sixth in 20 this year — that the Australian driver has failed to finish. Bottas regained the lead when Hamilton came in for his tire change on lap 25. "I was really managing the pace and the race," Bottas said. "The last five laps I started to go a bit quicker." Renault driver Carlos Sainz Jr joined Ricciardo in the paddock after an apparent steering issue ended his race with about 20 laps to go. Nico Hulkenberg was sixth — despite a five-second time penalty early on for cutting a corner in his Renault — and placed ahead of Force India drivers Sergio Perez and Esteban Ocon. Two-time F1 champion Fernando Alonso got ninth in McLaren's last race with the under-performing Honda engines before switching to Renault as its supplier for 2018. Veteran Brazilian driver Felipe Massa, the 2008 F1 runner-up to Hamilton, finished 10th in his last race before retiring.